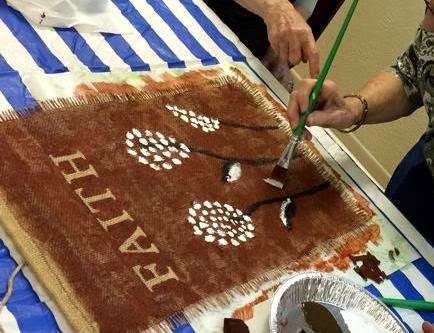 Saturday we had our first Art and Soul event at First Presbyterian Church Stephenville! We had a blast! I was nervous because I wasn't sure if we would end up with anyone able to come cause of the horrible flu that has hit every household in town! But we had a good turn out and I think everyone went home with a banner that they were proud of. 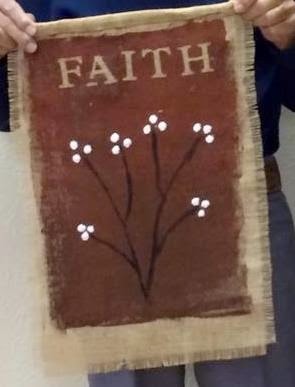 The set up was that we use burlap banners that one of the ladies in the church made. What a huge, huge help this was! Burlap is so messy I don't think Linda is going to be willing to do that again.. glad she made extras! 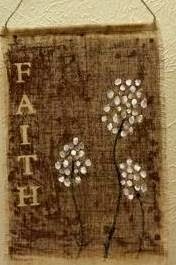 I cut out the word FAITH in vinyl letters for everyone. We strung hemp rope and a dowel rod through the top of the banner and the participants took the letters and placed them anywhere on the banner that they wanted. They then painted over the letters and anywhere else they wanted on the banner. They had raw umber, burnt umber, black and white paint for this step. After getting a base coat down, they painted a tree or flowers or something of their choosing. This was hard for some as they wanted me to tell them exactly what and how to paint! And Charlene wasn't shy about offering tips and suggestions! I also made a few window cross cut outs. Alisa cut one up to make a big F and one of the boys placed one in the middle of his banner. The finished banners! I absolutely love the variety! Even Maddie made one... under duress. She was hoping that there would be a baby there that she would "have" to hold and take care of. But I think she and her friend enjoyed the project too! I love this couple. They are adorable. They laughed through the entire project about the difference of their personalities. They remind me of my grandparents. And isn't this banner nice! I love that she made one that tells the story of her farm. And woohoo! Lexi got to make one. After being sick for three weeks and missing two weeks of school, it was nice to see her out and about! After we painted, we shared a meal together.